The Grand Central Dispatch was first introduced in iOS 4, and it offers great flexibility and options when trying to achieve concurrency, performance, and parallel tasks. It had a great disadvantage though until Swift 3: It was difficult to memorise its commands or easily write code regarding it, as its coding style was quite close to low level C, and it was obviously different than any other coding style in Swift, even in Objective-C. That was also the main reason that many developers were avoiding GCD on purpose, and they were choosing the NSOperationQueue. 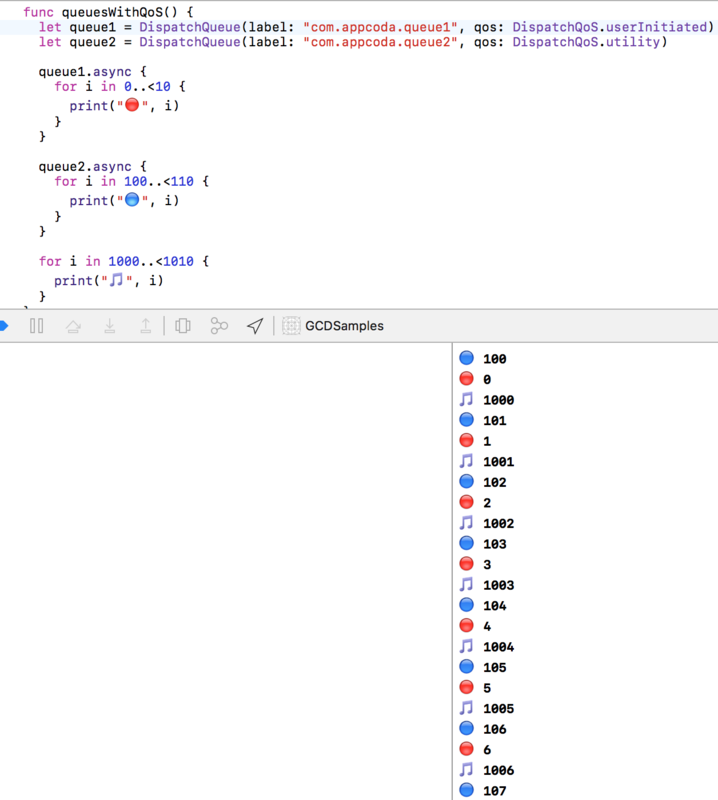 A simple web search about GCD in Swift versions other than the last one will give you a good taste of how GCD syntax had been. In Swift 3 things have dramatically changed. The way GCD is used is brand new, totally Swift-like, and the new syntax makes it a lot easier for developers to get familiarised with it. These changes gave me the motivation to write a post about the most basic and important things one can do with GCD in Swift 3. If you were using GCD with its old coding style (even a little), then this whole new syntax will seem like a piece of cake; if not, then you’re just about to learn about a new programming chapter. But before we go through all the specific topics of this post, let’s talk a bit about some specific concepts. First off, the dominating phrase in GCD is the dispatch queue. A queue is actually a block of code that can be executed synchronously or asynchronously, either on the main or on a background thread. Once a queue is created, the operating system is the one that manages it and gives it time to be processed on any core of the CPU. Multiple queues are managed accordingly, and that management is something that developers don’t have to deal with. Queues are following the FIFO pattern (First In, First Out), meaning that the queue that comes first for execution will also finish first (think of it like a queue of humans waiting in front of the counter, the first one is served first, the last one is served last). We will make that clear in one of our first examples later. Next, another important concept is the work item. 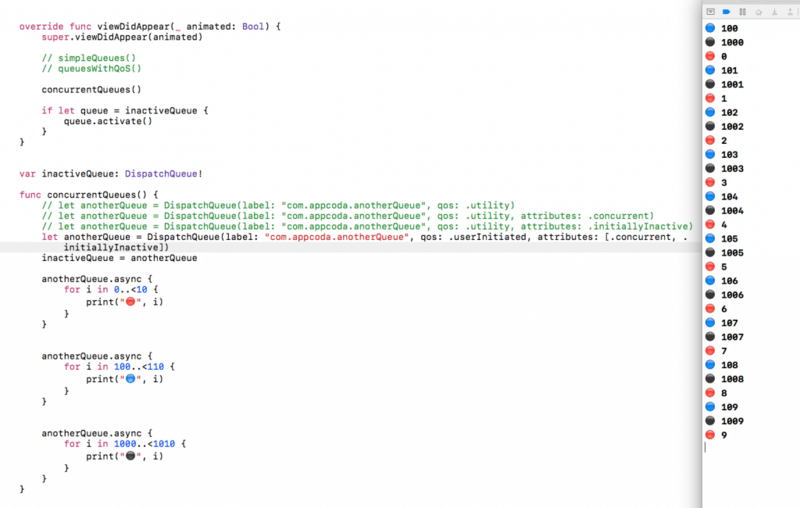 A work item is literally a block of code that is either written along with the queue creation, or it gets assigned to a queue and it can be used more than once (reused). 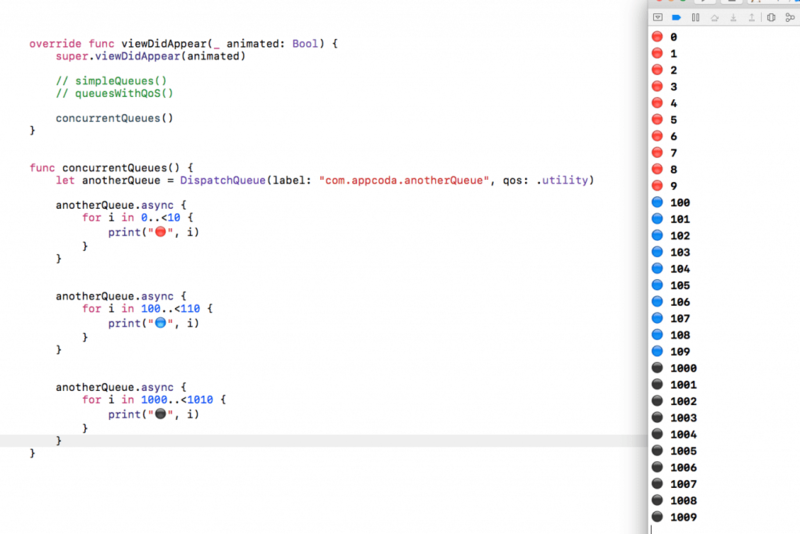 The work item is what you think of exactly: It’s the code that a dispatch queue will run. The execution of work items in a queue also follows the FIFO pattern. This execution can be synchronous or asynchronous. In the synchronous case, the running app does not exit the code block of the item until the execution finishes. On the other hand, when queues are scheduled to run asynchronously, then the running app calls the work item block and it returns at once. Once again, we’ll see all those differences later in action. Having mentioned the above meanings (dispatch queues and work items), it’s time to also say that a queue can be either serial or concurrent. In the first case, a work item starts to be executed once the previous one has finished (unless of course it’s the first item assigned in the queue), while in the second case the work items are executed in parallel. 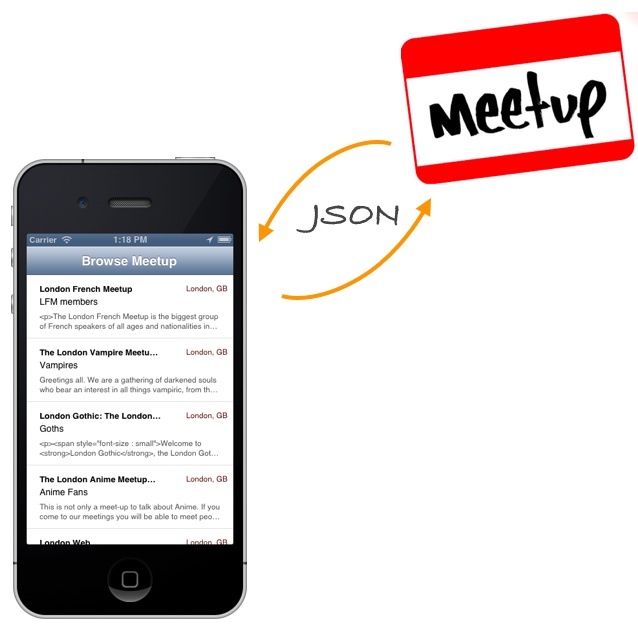 You should be always cautious when assigning tasks to the main queue of an app. This one should remain always available to serve the user’s interactions and the UI requirements. Speaking of that, and that’s another rule, any changes you want to apply to the UI must be always done on the main thread. If you ever try to make UI updates on a background thread, then it’s not guaranteed if and when the updates will take place, and most possibly you’ll have unpleasant surprises on the user’s experience. 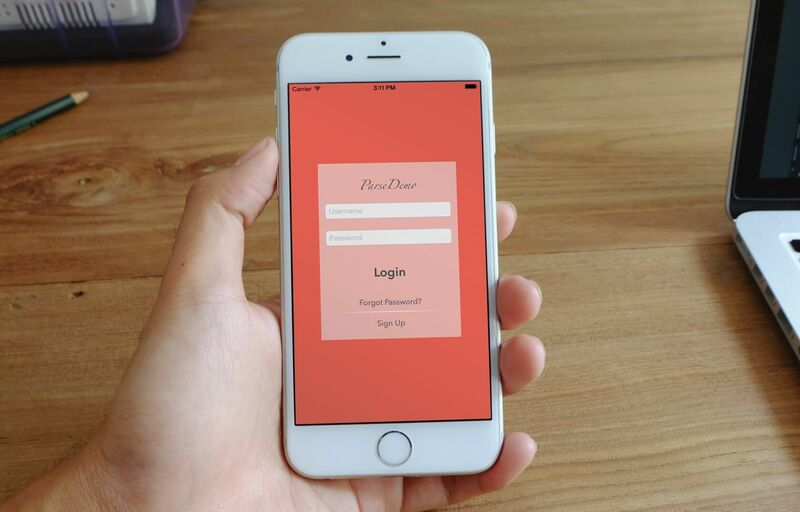 However, any prior work needed to be done so you can create or update the UI, can absolutely take place on the background. For example, you can download the data for an image on a secondary, background dispatch queue, but you’ll update the respective image view on the main thread. Keep in mind that it’s not always necessary to create your own queues. The system creates global dispatch queues that can be used for any kind of tasks you want to run. Regarding the thread that a queue will run to, iOS maintains what Apple calls a pool of threads, meaning a collection of threads other than the main one, and the system chooses one or more of them to use (depending always on how many queues you create, and how you create them). Which threads will be used are undefined to the developer, as the operating system “decides” depending on the number of other concurrent tasks, the load on the processor, etc, but seriously, who would like to deal with all these? In this post we are going to use small, specific examples for the GCD concepts that we’ll meet next. 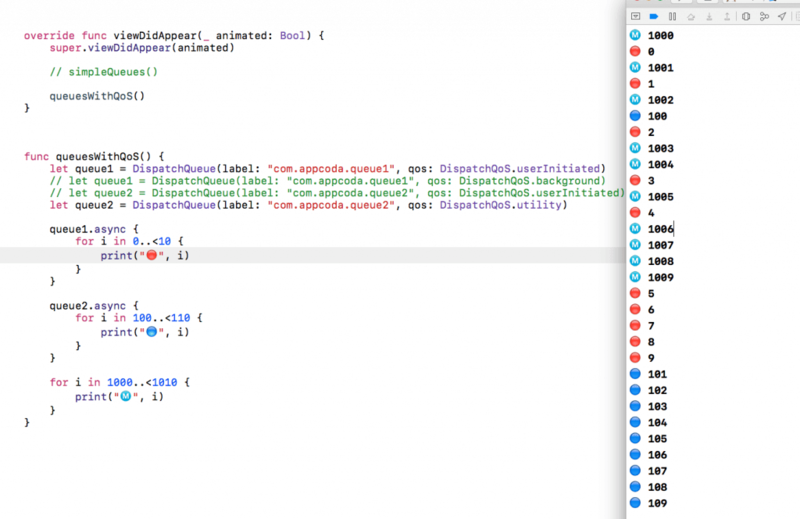 Normally, and given the fact that we’re not going to make a demo app, we could just use an Xcode Playground to work on, however this cannot be done with GCD. Calling functions from different threads does not work in Playgrounds. Some of our examples would run there of course, but not all. So, we’ll overcome any potential problems by using a normal project, and for your ease just grab this one and open it. 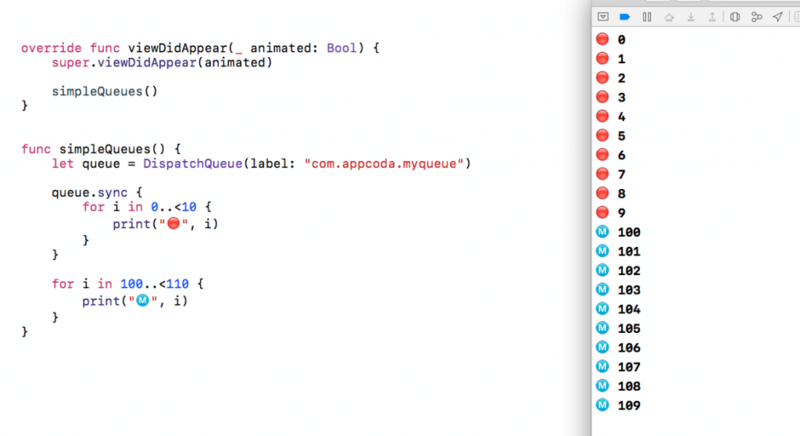 In the ViewController.swift file you’ll find a list of methods defined but not implemented. In each one of them we’ll meet a new feature of GCD, and all you need to do is to comment out the proper one in the viewDidLoad(_:) method so they get invoked. In the Main.storyboard, ViewController scene you’ll find an image view added, and the respective IBOutlet property connected to the ViewController class. 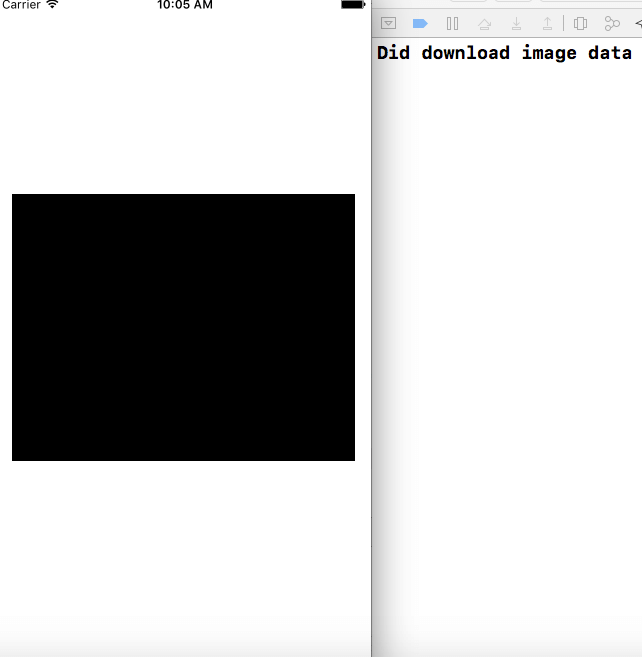 We’ll need that image view for a real world example later. The only thing you need to provide is a unique label for the queue, and that’s all. The reverse DNS notation (“com.appcoda.myqueue”) works just fine as it’s easy to create unique labels, and it’s recommended even by Apple. However, it’s not mandatory, and you can use any string you’d like as long as the labels remain unique. But other than that, the above is not the only initialiser for a queue; you can provide more arguments upon initialisation that we’ll talk about in a while. The red dot is to make the results easily distinguishable in the console, especially when we’ll add more queues or tasks to execute. 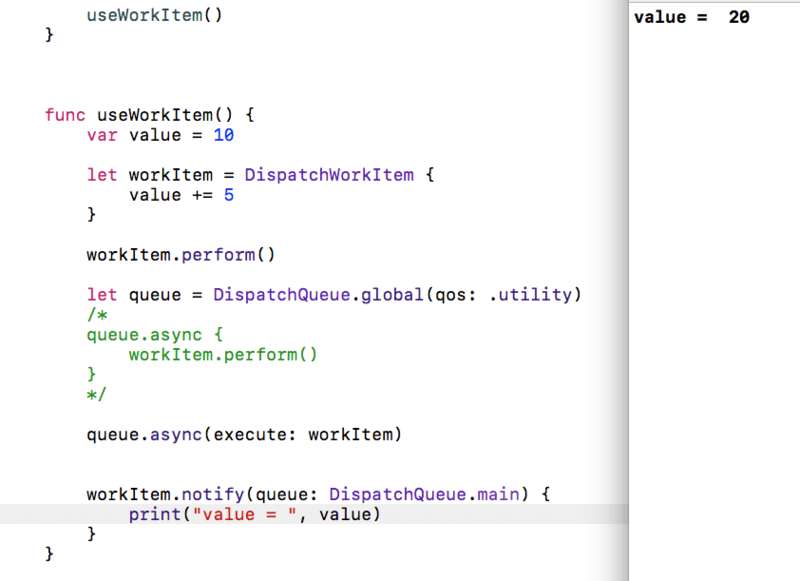 Comparing to the synchronous execution, this case is quite more interesting; you see that the code on the main queue (the second for loop) and the code of our dispatch queue run in parallel. Our custom queue could have actually get more running time at the beginning, but that’s just a matter of priorities (and we’ll see it next). The important here is to make clear that our main queue is free to “work” while we have another task running on the background, and this didn’t happen on the synchronous execution of the queue. Even though the above examples are quite simple, it shows perfectly clear how a program behaves with queues running synchronously and asynchronously. We’ll keep the colourful results in the upcoming parts as well, just keep in mind that a specific color represents the results of code running on a specific queue, so different colors mean different queues. It’s quite often necessary to tell the system which tasks of your app are more important than others and which need priority in execution when working with the GCD and dispatch queues. Of course, tasks running on the main thread have always the highest priority, as the main queue also deals with the UI and keeps the app responsive. In any case, by providing that information to the system, iOS prioritises the queues properly and gives the needed resources (like execution time on CPU) according to what you’ll specify. Needless to say that all the tasks will eventually finish. However, the difference lies to which tasks will finish sooner, and which later. 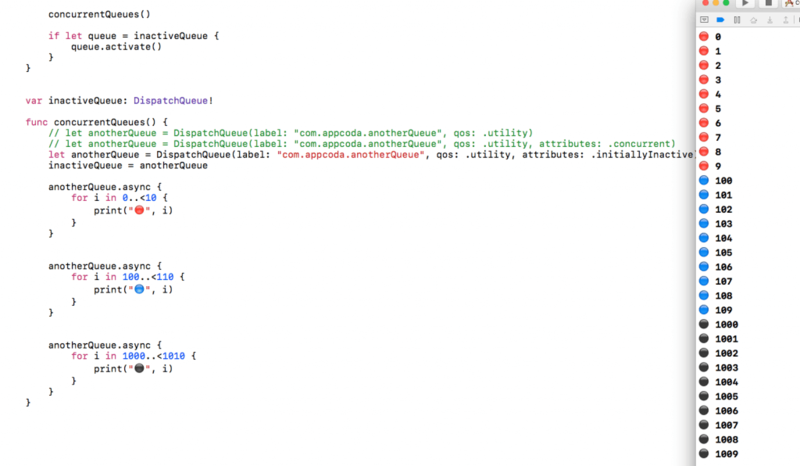 Notice that we assign the same QoS class in both of them, so they have the same priority during execution. Like we did previously, the first queue will contain a for loop that displays values from 0 to 9 (plus the red dot). 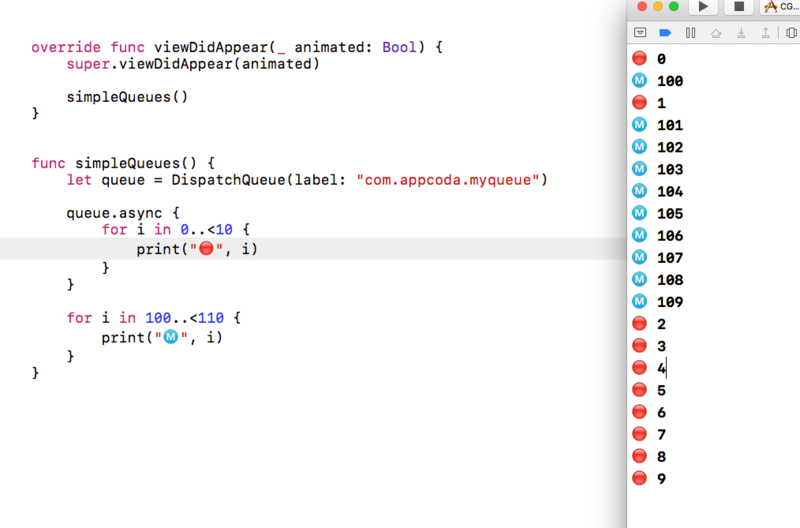 In the second queue we’ll execute another for loop and we’ll display values from 100 to 109 (with a blue dot). Undoubtedly, the first dispatch queue (queue1) is executed faster than the second one, as it’s given a higher priority. Even though the queue2 gets an opportunity of execution while the first one is running, the system provides its resources mostly to the first queue as it was marked as a more important one. Once it gets finished, then the system takes care of the second queue. This time the second queue finishes faster, as the utility QoS class gives a higher priority against the background QoS class. Once again, we see that the main queue has a high priority by default, and the queue1 dispatch queue is executed in parallel to the main one. The queue2 finishes last and doesn’t get many opportunities in execution while the tasks of the other two queues are being executed, as it has the lowest priority. So far we’ve seen how dispatch queues work synchronously and asynchronously, and how the Quality of Service class affects the priority that the system gives to them. The common thing to all the previous examples is the fact that our queues are serial. That means that if we would assign more than one tasks to any queue, then those tasks would have been executed one after another, and not all together. In this part we’ll see how we can make multiple tasks (work items) run at the same time, or in other words we’ll see how to make a concurrent queue. There’s a new argument in the above initialisation: The attributes parameter. When this parameter is present with the concurrent value, then all tasks of the specific queue will be executed simultaneously. If you don’t use this parameter, then the queue is a serial one. Also, the QoS parameter is not required, and we could have omitted it in this initialisation without any problem. Note that by changing the QoS class the execution of the tasks is affected as well. However, as long as you initialise the queue as a concurrent one, then the parallel execution of the tasks will be respected, and all of them they’ll get their time to run. The use of a class property in that case is necessary, because the anotherQueue is defined in the concurrentQueues() method and it’s visible only there. The app won’t know about it when it’ll exit the method, we won’t be able to activate the queue, but most importantly we’ll get a crash on runtime. Sometimes it’s required by the workflow of the app to delay the execution of a work item in a block. CGD allows you to do that by calling a special method and setting the amount of time after of which the defined task will be executed. In this case, the task will be executed 0.75 seconds after the current time. Also, you can avoid using the now() method, but you have to provide a DispatchTime value as an argument on your own. What I showed above is the simplest way for delaying the execution of a work item in a queue, and actually you don’t need anything else further than that. 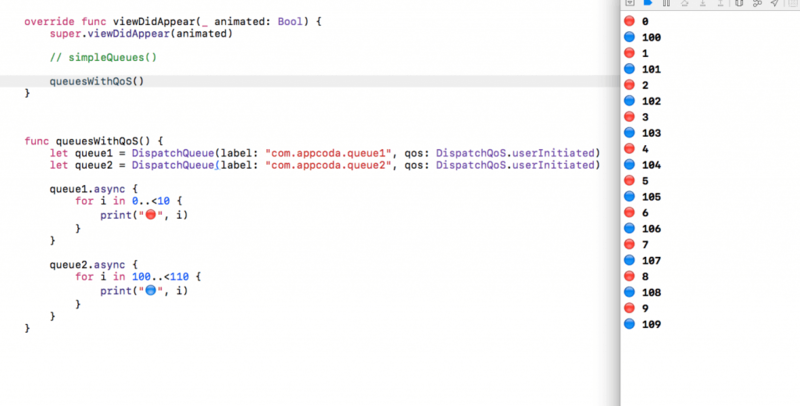 In all the previous examples we manually created the dispatch queues we used. However, it’s not always necessary to do that, especially if you don’t desire to change the properties of the dispatch queue. As I have already said in the beginning of this post, the system creates a collection of background dispatch queues, also named global queues. You can freely use them like you would do with custom queues, just keep in mind not to abuse the system by trying to use as many global queues as you can. If you don’t specify a QoS class (like we did in the first case), then the default case is used by default. 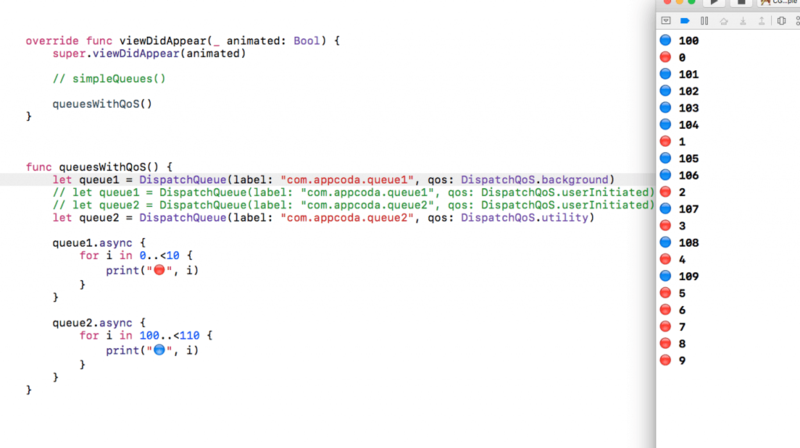 Actually, you’ll see all the available options you have for the main queue just by typing the DispatchQueue.main. 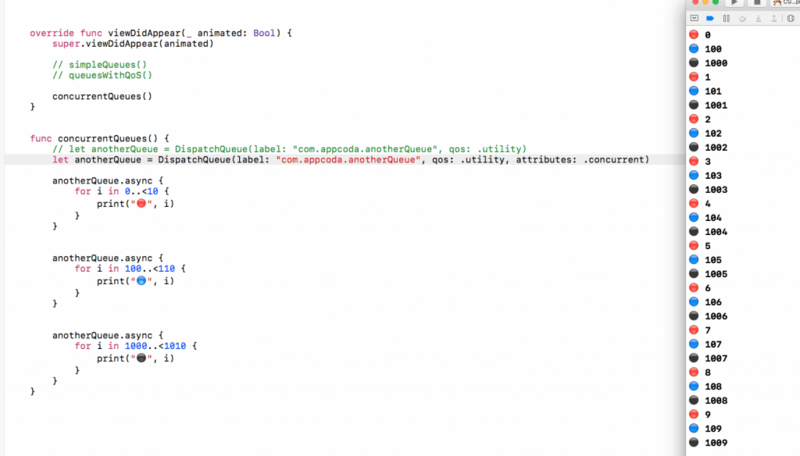 part; Xcode will autosuggest you all the methods that can be called in the main queue, but the above is what you need most of the times (in truth, that’s something that generally applies, and the available methods for any queue are auto-suggested by Xcode after typing the queue’s name and pressing the dot “.” symbol). You can also add a delay to the block execution accordingly to what we saw in the previous part. let imageURL: URL = URL(string: "http://www.appcoda.com/wp-content/uploads/2015/12/blog-logo-dark-400.png")! Even though we get the information that the image has been downloaded, we’re unable to see it in the image view because the UI has not been updated. Most probably, the image will be displayed several moments later after the initial message (something that is not guaranteed that will happen if other tasks are being executed in the app as well), but problems don’t stop there; you’ll also get a really long error log complaining about the UI updates made on a background thread. Run the app again, and see that the image view gets its image this time right after it gets downloaded. The main queue was really invoked and updated our UI. A DispatchWorkItem is a block of code that can be dispatched on any queue and therefore the contained code to be executed on a background, or the main thread. Think of it really simply; as a bunch of code that you just invoke, instead of writing the code blocks in the way we’ve seen in the previous parts. Most of the times, what you’ve seen in this post is quite enough all you need for doing multitasking and concurrent programming. However, keep in mind that there are GCD concepts not touched in this tutorial, or some others already discussed, but not seen up to the last detail. The purpose for that is that I wanted to keep it simple, so the content is understandable and comprehensive by developers of all levels and skills. If you generally don’t use CGD, consider seriously to give it a try and unload your main queue from heavy operations; if there are tasks that can be executed on the background, then send them on the background. In any case, it’s not that difficult to use GCD, and only positive results one can have by making apps more responsive and faster. Have fun with GCD! For the demo project, you can check it out on GitHub. absolutely marvellous …. 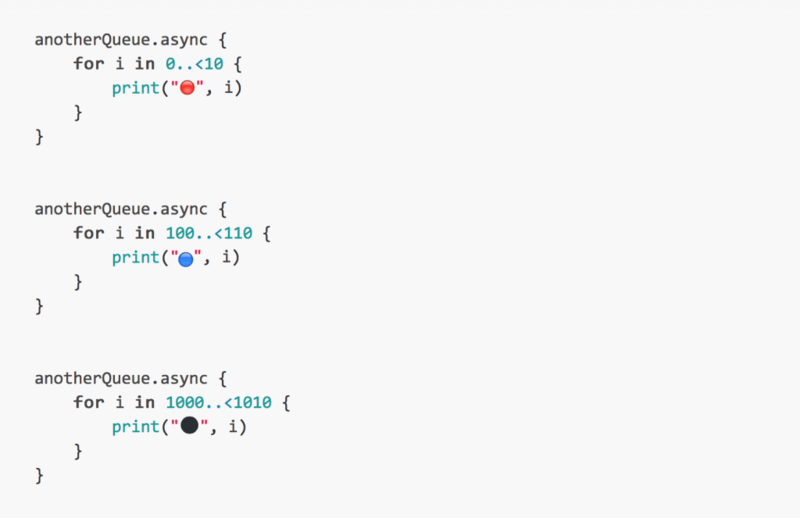 really helped me a lot & cleared my confusion about queue, sync/async , mainQueue etc. Thank You so much for your precious time & generosity . Have you tried .userInteractive priority? Don´t try it on the simulator, but on an actual device. Awesome Tutorial. Kindly add more information about DispatchGroup. Great tutorial! It helped me a lot. Thanks. Thanks Gabriel, I’ve enjoyed reading! Valuable information, well explained. What does the notifying the main thread do? I couldn’t find what it does on apple documentation. I’m guessing that it calls the block in the main thread, does it? The article is awesome, congratulations Gabriel. I learned a lot about queues. But I ended up with same doubt though. Did anyone find an answer to that? Saved my bacon this week. I use Realm for my iOS database and it was growing and growing and growing due to different threads holding open different versions of the database. Hit 30gb or so before it crashed the app. Moving all of my Realm access to a specific GCD queue using async solved the problem entirely (db never grows paste 1mb or so) and increased user app performance a bit as well. Thanks! Huge win! This is the best Swift thread tutorial I have found. Do any of the Appcoda books have even more advanced info on Threads ? In the last example, why did call workItem.perform() when you still intended to call queue.aync(execute: workItem) afterwards. Correct me if I’m wrong. Both do the same thing, right? Super! Very simple and very clear. Great man! Best tutorial on web. Nice article ! Do you have anything on DispatchGroup ? “A queue is actually a block of code that can be executed synchronously or asynchronously.” I think you mean an item on the queue. so you are wrong the main queue "DOES NOT" have a high priority by default.run the code multiple times and see by yourself.The thing is that when you have threads running "asynchronously" you can neither tell which thread will run first nor the code in the main queue will run first, to make sure the threads are run in some kind of guaranteed order you must use "DispatchGroup" and must enter and leave in a desired order. Just came across this. Fantastic article and explanation style! Nice Article, helped lot to understand GCD. I am getting random crash in useWorkItem(). Some time it works but value displayed is 15 instead of 20 as in last example. Please let me know reason.